This is a condition where uterine -wall gets adherent antero- posteriorly leading to mild to sever infection or injury. Adhesiolysis will restore menses and reproductive function. Adhesiolysis will also allow ample space of embryo to implant & grow. IUCD may be inserted post operatively to prevent re-adhesions. Septate uterus is commonest Mullerian Anomaly. It presents commonly as Recurrent Pregnancy loss.Resection of septum will improve implantation index & allow space & blood supply for embryo to grow. 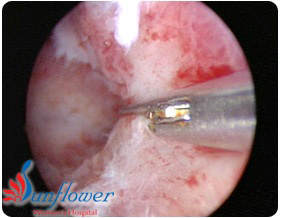 Hysteroscopy allows precise excision of septum without injury to normal myometrial tissue. Polyps are endometrial or myyometrial projections which prevents implantation by occupying space. Hysteroscopy excision by 5 fr scissors restores normal anatomy & also allows specimen for Histopathology. 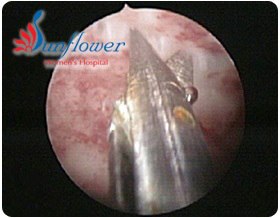 Sub mucous variety of fibroid (less then 3 cm size and not more than 2 fibroid) can be removed through hysteroscope. Retained products of conception (fetal bone) & lost IUCD can cause infertility by hampering implantation. Hysteroscopy can be used to remove these without any con current endometrial damage..
Cornual block of the fallopian tube can be negotiated with guide wire and tuble patency can be established. Some times uterine cavity volume is less because of adhesions. Releasing these adhesions from fundus (fundal metroplasty) and from lateral wall (lateral metroplasty) will improve the chance of future pregnancy.